If a picture is worth a thousand words, what’s the value of a striking, cool chart or map of some BLS data? At the U.S. Bureau of Labor Statistics (BLS), we’re always thinking of better ways to help our users understand the information we produce. The global economy is complex, and the statistics to explain the economy can be complex too. Data visualizations are one tool we use to present our data more clearly. What are data visualizations? They are any method of presenting numerical information visually—most commonly through charts and maps. Good data visualizations can improve understanding for all types of audiences, from students of all ages to experts with advanced degrees in economics, statistics, or other fields. In recent years we’ve done more to include data visualizations in nearly all our publications. We have designed two of our publications to showcase data visualizations. One is The Economics Daily—or TED, as we call it. We publish a new edition of TED every business day, and we’ve done that since 1998. Each edition of TED typically includes a chart or map, sometimes two, with a few words to explain the data in the visualization. Another publication geared toward data visualizations is Spotlight on Statistics. Spotlight tells a longer, more detailed story about a topic through a series of visualizations presented in a slideshow format. As with TED, Spotlight includes brief written analysis to explain more about the data. Even our publications that feature mostly written analysis often include visualizations to tell a more complete story. Our flagship research journal, the Monthly Labor Review, has evolved a lot over its 100 years of publication to serve readers better; that evolution includes more and better data visualizations. Beyond the Numbers and BLS Reports often include visualizations as well. For an even broader perspective, we have a Spotlight on Statistics that examines long-term unemployment more fully. Now check out the interactive version of this map that we published in the March 9, 2015, edition of TED. When you hover over each state, more information pops up to show the state’s employment–population ratio in 2014 and how much it changed from 2013. When you hover over the items in the map legend, the states in each category light up more brightly to help you see the states with similar employment–population ratios. When you click on each state, you go to a webpage that provides even more information about the state’s labor market. Interactive features in our charts and maps give you the power to choose what information you want to see. If you like the interactive features in our charts and maps, I think you’ll love the animation in some of our visualizations. Animation adds a time dimension to our data to let you see how measures change. For a great example of animation, see a TED we published last year that shows state unemployment rates before, during, and after the Great Recession. The BLS website will feature even more data visualizations soon. Check the BLS blog to learn more about them. 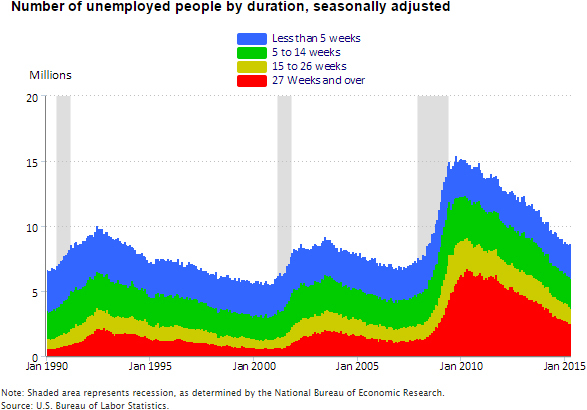 We share many of our data visualizations on Twitter, so follow us @BLS_gov. You also can sign up to receive email alerts for TED, Spotlight on Statistics, and our other publications. And if you have created a great visualization of BLS data, please share it with us and the readers of this blog!Erica L. Groshen is the Commissioner of Labor Statistics. This article was originally posted on the Bureau of Labor Statistics blog.